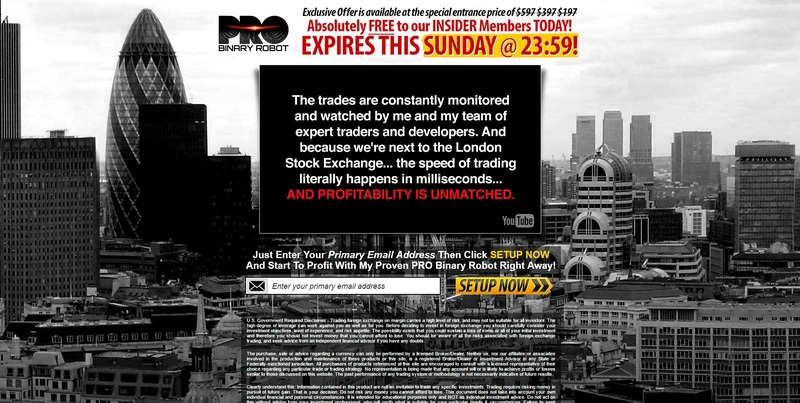 Benson claims to be a former trader who created a binary options trading software called Pro Binary Robot. This software can allegedly make you between $5,489 and $7,578 per week. And as usually with money making programs Pro Binary Robot is free, so you can get rich for free. Or not. Pro Binary Robot is of course a scam and Bobby Benson is a scam artist, or rather a fictitious person. This program is not free and it won’t make you a single cent. Pro Binary Robot is designed to take your money and lose it in trading with binary options. Here is the proof. According to Benson Pro Binary Robot is a unique trading robot. But it is a lie. It is just a white label scam software with a new name. As you can see on the image, there are other robots using this exact same software, like Swiss Binary Robot, Binary Godfather or Hexa Trader. And these are just a few examples, there are dozens of scams based on this same software. Thanks to this fact we have a lot of feedback from real users about the real performance of this robot. And they all say it is losing money in real trading! A lot of people struggle to understand why scammers offer a free software that is losing money. So let us explain this. Pro Binary Robot is not really free, because you won’t be allowed to use it until you deposit money with a selected broker. The reason is that these scammers are getting paid by this broker for referring new depositors. Now you can see why they make up stories and why they can afford to give you a losing software for free. They will get paid by the broker before you realize that you have been scammed. Pro Binary Robot is a dirty scam that will force you to deposit money with an unregulated broker and then it will lose your money. Stay away from it! If you want to see how real money can be made in binary options trading, try a free demo account with a regulated broker. Learn and test on the demo until you can trade with consistent profits. Only then you can start trading with real money.